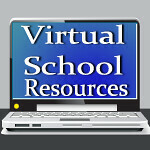 Virtual School Resources: Back to School Blast Giveaway! I'm excited to be participating in the Back to School Blast which runs from August 1st through August 14th! For us, that's the last two weeks before school starts! How about you? Will you be ready to enter to win some fabulous back to school prizes? If you are a blogger who would like to participate in this hop, you have until July 27th to sign up and join the linky. As always, if you wait until the last minute, you will be lower on the linky, so why not sign up today? 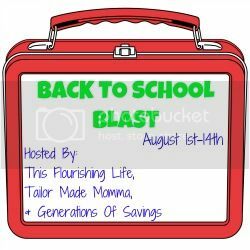 Thanks to This Flourishing Life, Tailor Made Momma, and Generations Of Savings, there will be a lot of blogs to hop, and a lot of prizes to enter to win! Whether you have a preschooler, a college student, a homeschooler, or anything in between,you'll be needing back to school gear! See you then!